First game of the second day the match ups were posted and I discovered I was playing a fellow Team BREWS member. Burning River Electric Warhammer Studs. Or something like that. At least the "Burning River" and "Warhammer" parts are right. In any case, it's our tournament team name for the local game store (Recess Games) group. I was ready to go, in spite of a slight hangover and a little less sleep than I had planned. Side photos this time. Marienburg on the left, Dogs of War on the right. The filthy Dogs of War had, from the bottom of the pic, to the top... Golfags Ogres, Lv. 4 Mage, Marksmen, Mengil Manhide's DE guys, Vespero's Vendetta, two units of pistol armed duelists, a Lv 2 Mage, Volands Venetors, Paymaster on a horse, one galloper gun (has moved up behind the skull), and the RoR halflings whose name I currently forget, and another lv. 2 mage. From forground to background, the righteous army of Marienburg had... knights, a cannon, volley gun and another cannon in the woods, swordsmen & detachments, pikemen, swordsmen & detachmetns wiht a unit of knights in front, pegasus behind the giant skull (a lot of those around this part of the Warhammer world, it seems,) and pistoliers. That last bit was sort of screwed up. I should have made sure the knights were going after the hobbits, the pistoliers were bound to get shot to pieces. I don't remember the order of placement at this time. Hobbits move up, shoot the crap out of the pistoliers. The mob of skirmishers in the center advances slowly, ogres decide they don't like being shot, so begin to advance more enthusiastically. Mengil's Dark Elves and the Marksmen start to inflict heavy casualties on the swordsmen in the foreground. As the pistoliers do what they do best (run off the battlefield) and the nasty hobbitses round the volcano, the pegasus decides it's time to seek safty elsewhere. (I think I actually fled from a charge - not sure from whom.) The knights in the center make a charge to chase away some skirmishers, which sends Mengils DE's running as well. The knights pursue into Voland's Venetors to try to drop their numbers before the infantry line hits. The last ogre in the foreground runs over the knights. The cannon disappears after I miscas, resulting the DoW mage getting a free casting of Pit of Shades. There's a little gap betwen the last pic and this one... 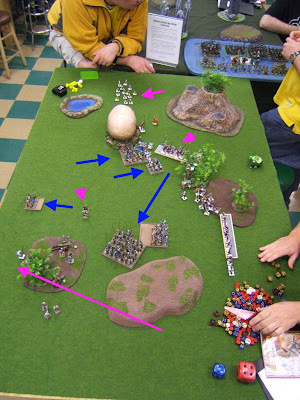 In the foreground, the last ogre has been ventilated by the volley gun. The DoW mage has jumped (Steed of Shadows?) behind the woods looking for a good casting spot. The action is happening in the center, around the skull. 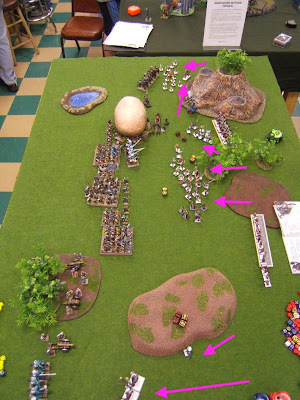 The DoW skirmishers rally and start moving back trough the woods. The pikemen charge & finish off Mengils, but the pursuit leaves their flank dangling in the eyes of the distant Venators. 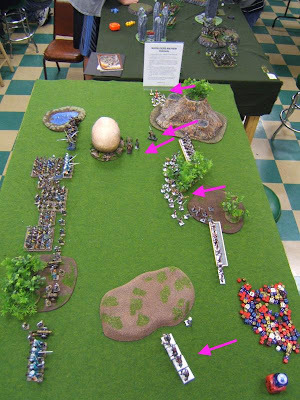 In order for the Venators to charge, the duelists in their way have to charge the swordsmen near the giant skull. The pikemen flee, becoming the largest point value (inadvertant) bait & flee unit I've ever used. The failed charge of the Venators leaves their flank open to a pursuit move by the swordsmen unit, who break them on the next round of combat. The Pike rally the next turn as well. 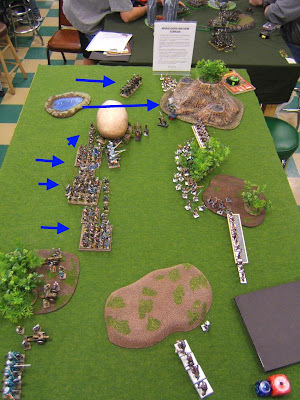 The swordsmen in the forgreoun (behind the pike, in the pic) never make it to the Marksmen, continuing to eat crossbow bolts until there's three guys left at the end of the game.